Math "I Can" Posters - All Things Special Ed. Do you struggle with what to teach in math for each grade level? 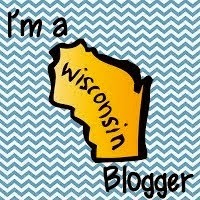 Well one thing that really helps me narrow down my focus is looking at grade level standards. In my state, we use the Common Core State Standards to guide our teaching. As a special education teacher to students with varying disabilities, many with Autism and Intellectual disabilities, we teach towards the Common Core Essential Elements which are the alternative standards to the Common Core. The Essential Elements are aligned with the Common Core as well as to the alternative assessment called the Dynamic Learning Map (DLM). I think it is important that our students know what they are working on so I created student friendly posters with "I Can" statements for the Essential Elements math standards. This one is currently for Kindergarten and I will be adding grades 1st through 5th shortly (as well as ELA). 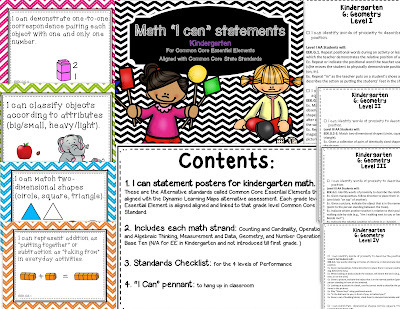 ** "I Can" statement posters for Kindergarten math which includes each math strand for Kindergarten: Counting and Cardinality, Operations and Algebraic Thinking, Measurement and Data, Geometry, and Number and Operations in Base Ten (n/a for EE in Kindergarten). **Also included in this product is a standards checklist for you, as the teacher, to keep track of teaching the standards. Also great for IEP goals and data tracking! Each standard is divided into the 4 levels of performance (IV, III, II, and I) with examples of what that looks like at that level (just ideas, not a comprehensive list). ***Along with the "I can" Posters there is an "I can" pennant to hang up on the wall along with the statement posters. These are great for students to know what they are working on. What do the checklists look like?